Every year motorists in British Columbia experience what are commonly referred to as “Bear Jams”. These dangerous situations occur when vehicles stop in an unsafe manner to view, feed, photograph or approach road side bears. At the height of summer when highways are at their busiest it is not unusual to see the sides of the roads literally “jammed” with vehicles at the location of a bear sighting. These “bear jams” pose several problems and create a great deal of risk for the observers, other motorists and the bears themselves. Slowing down or stopping your vehicle can lead to collisions risking the lives of both people and bears. In 2004 the Insurance Corporation of British Columbia records show that over 9,000 animal-related collisions occurred costing policyholders more than $23 million. 396 people were injured by collisions with wildlife (Table 3.04, Traffic Collision Statistics, BC, 2004) and 10 people were killed by collisions with wildlife (Table 3.04, Traffic Collision Statistics, BC, 2004). PLEASE DO NOT STOP in the middle of the roadway to view or photo stalk the bears. PLEASE DO NOT GET OUT OF YOUR CAR! PLEASE DO NOT FEED ROADSIDE BEARS. IT IS ILLEGAL IN BC – maximum penalty of $50,000. WHEN roadside bears are fed non-natural foods they begin to associate these locations as feeding stations returning regularly looking for handouts. This causes a high risk of vehicle collisions resulting in human and bear injury or mortality. WHILE DRIVING: actively watch for bears as they may bolt out onto the road and they may have cubs in tow. THE BEST THING YOU CAN DO FOR HUMAN SAFETY and our bears IS TO KEEP DRIVING AND NOT PULLOVER! Even more dangerous is the attempt to approach the bear(s) on foot and leave the safety of the vehicle. “Bears have a personal space, for some it is a few metres for others a few hundred metres. 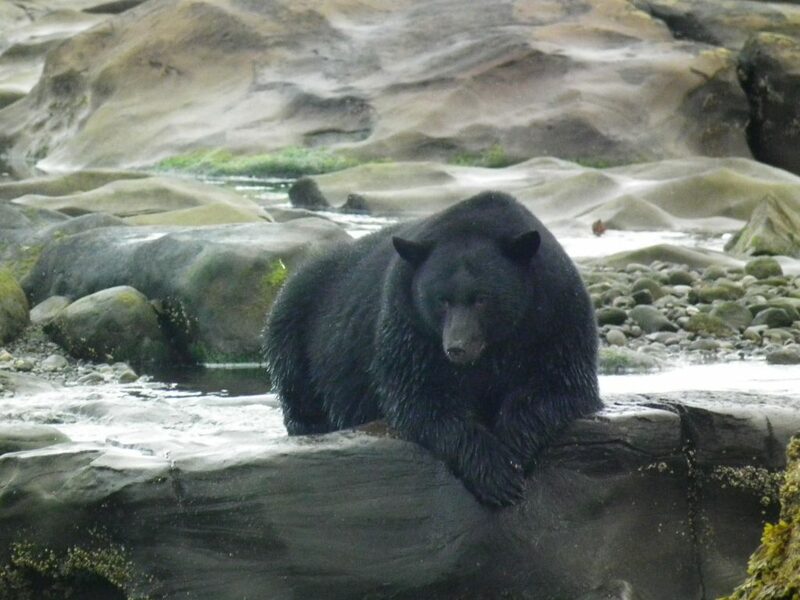 Intrusion into this space is considered a threat and may provoke an attack.” (Safety Guide to Bears in the Wild – BC Environment) This puts the observer in a very unsafe position, especially when a mother bear is protecting her cubs. Just because cubs are not visible does not mean that they are not nearby, most likely hiding in a tree. A safe viewing distance is approximately the length of a football field as bears have been clocked at moving 55 km/hr. If you do wish to view and photograph bears in their natural environment be sure to book a professional wildlife tour with a company that advocates safe bear-viewing for people and the bears. The local visitor’s centre will be more than happy to help you choose a local tour company. These tours will allow you to observe natural behaviour of a variety of local wildlife without interference or destruction of their habitat. Be Bear Smart this summer and help prevent human-bear conflict.